This is the final author copy of an article that appeared in the AWWA proceedings from the Water Sources Conference: Reuse, Resources, Conservation, held Jan. 27-30, 2002 in Las Vegas, NV.2002, American Water Works Association. Kjelgren, R., F.A. Farag, C. Neale, J. Endter-Wada, J. Kurtzman, 2002. 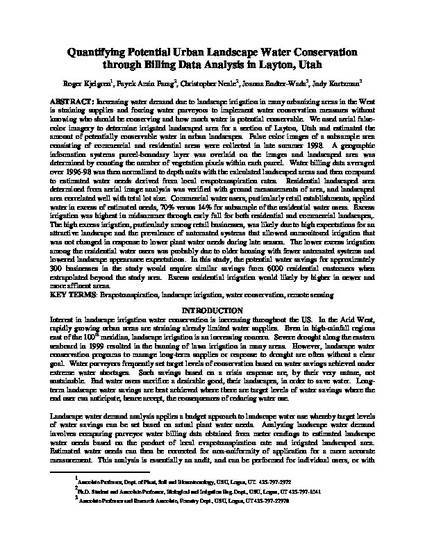 Quantifying potential urban landscape water conservation through billing data analysis in Layton, Utah. In: Proceedings, American Water Works Association Sources 2002: Reuse, Resources, Conservation, January 27-31, Las Vegas, NV.